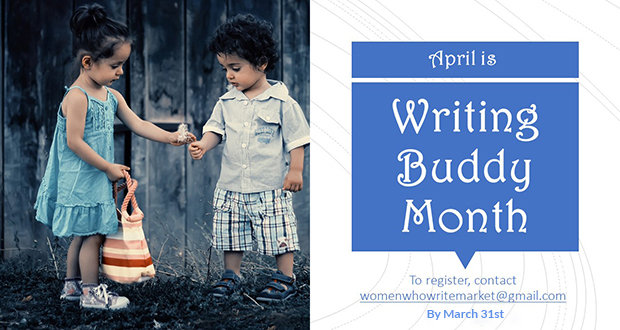 Home > News > April is Writing Buddies Month: Just Say Yes, and Write! Just Say Yes, and Write! Women Who Write, write. Right? And, so we should. Should write and write and write some more and be motivated by each other in our writing. Why not make a commitment to write and share that writing with a buddy? Every day, three times a week, or even once a week – you and your Buddy determine the level of writing and reading to which you can commit. At a minimum, it should be once a week but you are encouraged to go for it! The rules for reviewing are the same as we have for our readings in the monthly meetings. -If solicited, offer suggestions for improving the piece. – Be kind. Be clear. Writing is an art. As such, it can be perfected by regular and dedicated practice. And by sharing with another like-minded person. I am always inspired when I leave our monthly meetings by the wide variety of writing shared, and by the many direct and profound comments offered on a particular reading. Join with us in the month of April and make a commitment to write every day… yes, every day! And see where you land on the first of May. Include your name, email address, preferred way of contact (text, phone, or email), your style of writing (poetry, non-fiction, magical fiction, memoir…) and whether you have a buddy in mind or would like to have one arbitrarily assigned. If you know a member you’d like to have as your Buddy, please note that person’s name when you register. Otherwise, we’ll match you with someone. Writing Buddies will be assigned by March 25.